The popular coastal X43 bus service has resumed for the summer. The first bus leaves Weymouth’s King’s Statue at 10.05am and the last bus of the day leaves Swanage Bus Station at 5.30pm. In addition to serving Wool, Lulworth Cove and Wareham, the X43 also provides access to the Swanage Railway at the Norden park and ride site. For timetable details visit http://www.travelinesw.com or call 0871 200 2233. A COASTGUARD rescue officer has been commended for her 30 years of hard work and dedication. 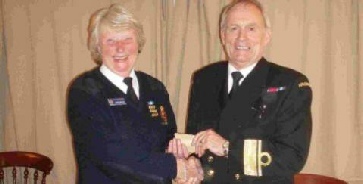 Sarah Welton from Lulworth Coastguard Rescue Team was presented with her long service clasp by acting chief coastguard Peter Dymond at the Royal British Legion in West Lulworth. A clasp is presented after every additional 10 years service after the initial 20 year Long Service Medal is achieved. Sarah enrolled in the Kimmeridge Coastguard Team in 1981, before moving to the Lulworth team in the late 90s. Sarah has also received three Chief Coastguard Commendations in the past 30 years with the team, for rescues involving saving a distressed lady on Christmas Eve in 2003 and helping a sailor aboard the yacht Tekoa just minutes before the boat broke up after it ran aground at Kimmeridge in 1992. In 2005 she, along with the Lulworth team, was involved in the search and rescue mission of two teenage boys who were swept into the water at the Cove. A third boy was also swept out but was able to get back ashore. The team was called out in the days after the tragedy to help with searching caves and areas as requested by the family and police, until both boys’ bodies were recovered up on the far side of the Cove. Once again team members were awarded the Chief Coastguards Commendation for their actions and dedication. Weymouth sector manager Rob Sansom said: “As well as her rescue duties, Sarah has been active in accident prevention initiatives in the local area, particularly with schools and youth groups. THE EXOTIC sound of a tuk tuk will soon be heard among the Purbeck hills. 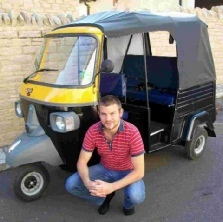 Entrepreneur Mike Cox has got hold of a vehicle to provide the first tuk tuk transport service in the area. He hopes it will be the first step to one day owning a fleet of the motorised rickshaws to transport visitors and residents across Purbeck. The 27-year-old came up with the idea after discussing it with his neighbour and decided to embark on the business venture. Mike said: “I decided to go and get the funds together and buy the first one. Mike said he knows of other locations around the country, such as Bognor Regis, where tuk tuks have proved popular and he was confident it could work in Purbeck, particularly with the attractions it has to offer tourists. He has now been given the thumbs up to start operating by Purbeck District Council and says the tuk tuk will provide a cheaper and greener way for people to get around. Mike, who moved to West Lulworth from Bournemouth last year, said: “It’s cheaper than most taxis. “Where I live the next village is five miles away and you are looking at up to £15. Mike said he was hoping to build up enough funds in the next six months to a year to then be able to invest in a second vehicle. He will be able to carry up to three people in the tuk tuk, which he recently bought in Birmingham. Mike – who has worked in banking, as a locksmith and as a taxi driver – said he hoped his tale would prove a positive example to other young entrepreneurs thinking of setting up their own business after struggling to find employment. The Revd. Nicola Coleman is to be the new incumbent for The Lulworths, Winfrith and Chaldon. Her installation and licensing service will take place at 7.30pm on Tuesday 25 September 2012 at Holy Trinity Church, West Lulworth and will be conducted by the Bishop of Salisbury, the Rt. Revd. Nicholas Holtam. Nicola has been the incumbent of Holy Innocents Church, South Norwood in Southwark for the past six and a half years but now feels God is calling her to a rural ministry. Before being ordained, Nicola had worked as a professional actress and wardrobe mistress at the Royal National Theatre. While working in the theatre she met her husband Michael Parsons. Nicola and Michael have two children, Sebastian six and Belle two and a half. Dorset has been a large part of Nicola’s life since childhood. She grew up in Winford, North Somerset but made frequent visits to Swanage to visit friends and family who continue to live in the area. Her hobbies include walking, theatre, reading, football (as a Bristol City supporter) and travel. Nicola will also become a Foundation Governor (ex-officio) of Lulworth & Winfrith Primary School. The Bishop of Salisbury, the Right Reverend Nicholas Holtam, licensed the Reverend Nicola Coleman to be the Priest in Charge. A full congregation filled Holy Trinity church in West Lulworth for a welcome service. It included 35 people from Ms Coleman’s former congregation at Holy Innocents, South Norwood in the Croydon diocese. 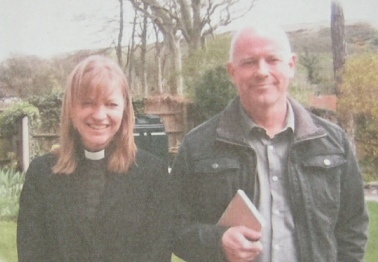 Jeremy Selfe, the benefice secretary, said: “A special hymn was sung to wish the new member good fortune as she and her family make the transition from an urban to a rural lifestyle. Leaders of the local community were invited to play a part in the service on behalf of the benefice. These included representatives from a nearby primary school, the Roman Catholic and Methodist churches, the Lulworth Army camp, the local farmers and businesses as well as the parish, district and county councils. After the keys of the church were handed to Ms Coleman by the Archdeacon of Dorset, the Venerable Stephen Waine, the eager new member tolled a bell to mark the start of her ministry. A formal procession closed the service. 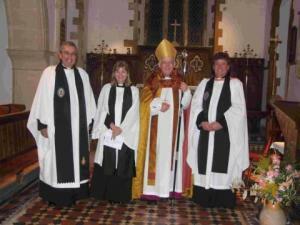 RESIDENTS of Lulworth, Winfrith and Chaldon flocked to a church to welcome a new member.